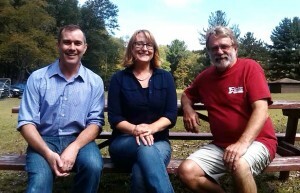 State water trail program manager Frank Maguire (above, left) led the annual meeting of the Pennsylvania Water Trail Partnership, which was hosted at Camp Lackawanna by the Endless Mountains Heritage Region, which was represented by executive director Annette Schultz and greenway coordinator David Buck. The annual Pennsylvania Water Trail Partnership (PWTP) meeting was held at Camp Lackawanna at Vosburg Neck near Tunkhannock on Sept. 11, the first time that the group has met outside of the Harrisburg area. The meeting in Wyoming County was hosted by the Endless Mountains Heritage Region (EMHR), which manages the North Branch Susquehanna Water Trail. “The idea was to get people out of an office conference room and closer to the places we work to promote and protect,” said state water trails program manager Frank Maguire. Water trails are defined by PWTP as “recreational and educational corridors between specific locations that can be used for single day or multiple day trips on and along waterways.” Common features include well-marked access points, boat launches and day use sites. Water trail managers are charged with providing the information that assures enjoyment of their respective stretches of rivers and streams via trail maps, signage, and websites. EMHR executive director Annette Schultz welcomed guests on Friday morning and offered opening remarks, and Maguire guided the meeting, which included updates from each of the water trail managers in attendance, a discussion about sojourn mini-grants for 2016, a sneak peak at a website under development by the Chesapeake Conservancy, and presentations by representatives of the Schuylkill River Water Trail and the PA Department of Conservation and Natural Resources (DCNR). “EMHR promotes the Susquehanna River and its extensive watershed as one of the region’s premier venues for outdoor recreation, as well as a nationally significant heritage destination,” said Schultz. The North Branch of the Susquehanna River was designated in 2009 by the National Parks Service as a National Recreational Trail. It is one of 27 designated water trails in the state comprised of 2,172 miles of publicly accessible waterways. The PA Water Trails Program was initially established by the PA Fish and Boat Commission, which was officially joined in 2008 by the National Park Service, DCNR, and the PA Environmental Council, the latter of which employs Maguire. “We are not actively seeking new trails, but rather looking to strengthen the ones that exist and help maintain a quality and consistency throughout the program,” he stated. EMHR greenway coordinator David Buck also serves as the manager of the North Branch Water Trail, which extends south from Sayre-Athens in Bradford County to Berwick at the Luzerne and Columbia county line and also includes the portion of the Susquehanna River that loops around Great Bend in Susquehanna County. Its vast watershed extends to all four counties in the Endless Mountains Region. The North Branch has also been designated a part of the Captain John Smith National Historic Trail because of its central role in the interactions between Native Americans and colonizing Europeans. EMHR has hosted and facilitated several sojourns by Native American tribe members whose ancestry is tied to the river. EMHR has successfully brought attention to the river and support from DCNR for further recreational and heritage development through annual sojourns, river cleanups, wayfinding signage (mean to be visible from the water), and the production of maps that guide visitors down the corridor and into active river towns. Buck welcomed the participation and presentations by the Chesapeake Bay Foundation and the Chesapeake Conservancy, as well as the opportunity to field their concerns. Such agencies have a vested interest in everything that happens upstream and have demonstrated a willingness to help further support EMHR’s endeavors. “That’s going to springboard us into some other events and potentially help us add more access points and provide more educational programs,” Buck noted. 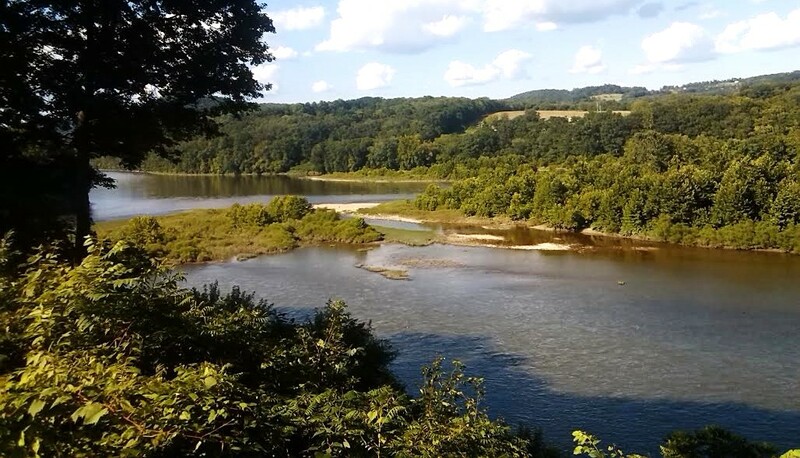 He looks forward to reconvening with water trail managers at the annual two-day Susquehanna River Symposium, which will be held at Bucknell University in November.